My world travels have not yet taken me to Tokyo, but my friends tell me it’s a bustling city filled with glass and steel. While this can be said of many great cities, there must be something special about Tokyo. 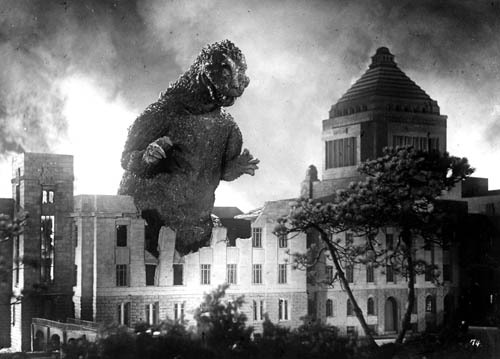 Destroying Tokyo was popularized by Godzilla in the 1950’s. He had his own reasons for doing it – revenge, bad toothache, maybe he was frustrated the people’s speech didn’t match their lip movements…. For whatever reason, Godzilla ravaged Tokyo a couple of times, and after that every monster has considered destroying Tokyo to be the culmination of their monster careers, right behind controlling the world (see future feature). My amateur advice to the people of Tokyo: build low to the ground, plan and practice escape routes from the city, work on your speech patterns. And most importantly, buy stock in construction companies. Asia, Godzilla, Japan, monsters, Tokyo.